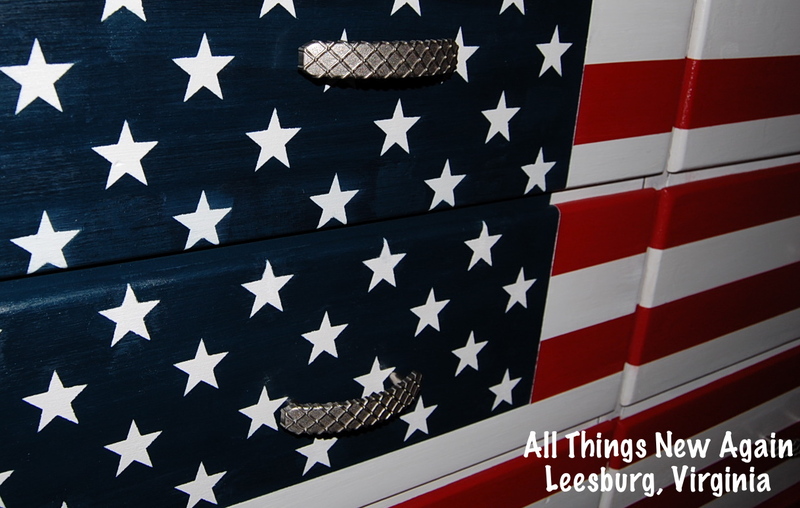 Painting an American flag onto a dresser or other piece of furniture involves a little more than just red, white and blue paint. 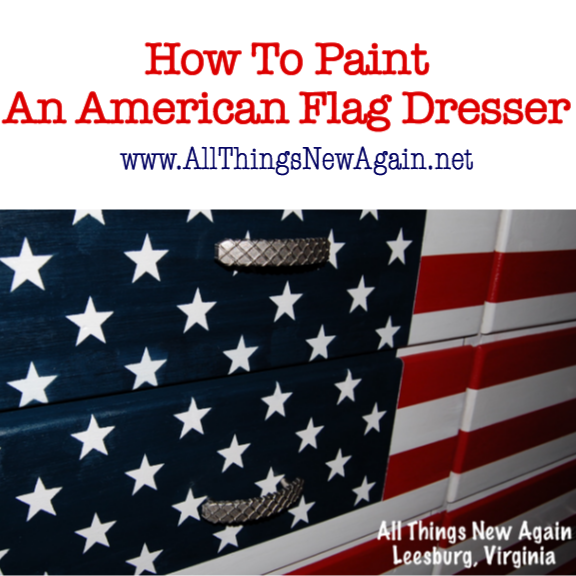 This tutorial will teach you How to Paint A Patriotic American Flag Dresser that fits perfectly onto any size dresser with the same proportions as Old Glory. 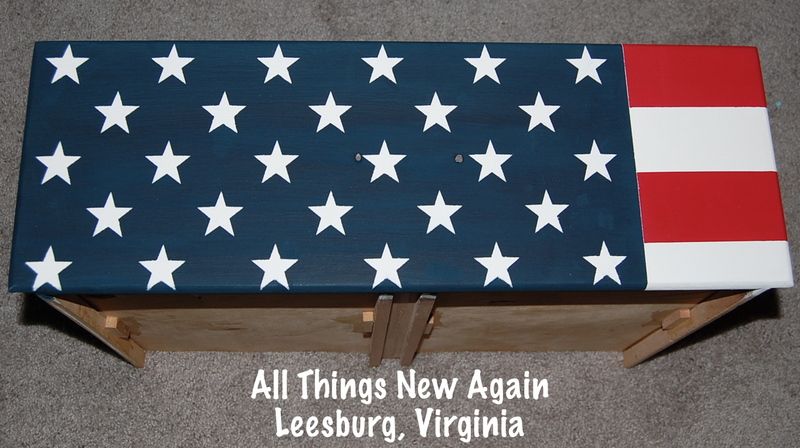 A local interior designer came to us here at All Things New Again in Leesburg, Virginia with a custom order to paint the American flag onto the front of a child’s dresser. She wanted to surprise her client with a great gift for his son’s bedroom. Also, her client is no ordinary client, but an active duty U.S. Marine Corps officer. I had to make sure this Patriotic American Flag Dresser was accurate—a U.S. Marine will surely notice if the finished flag has only 44 stars or 11 stripes because I couldn’t get everything to fit onto the dresser! 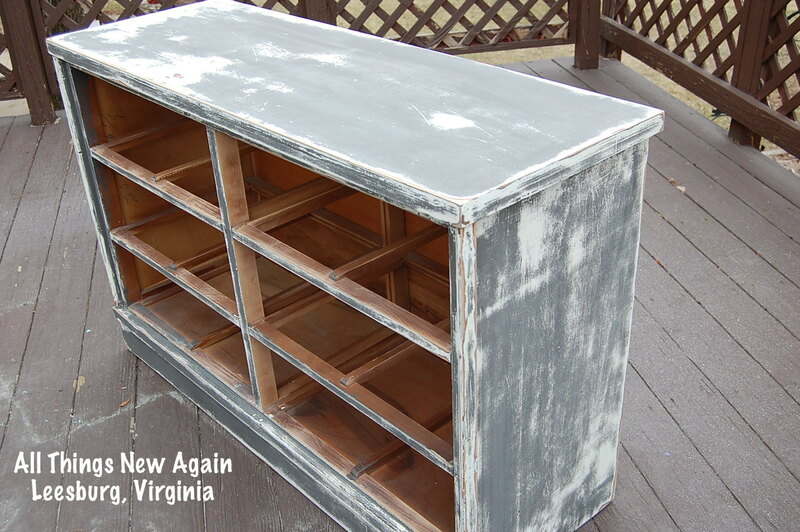 The dresser was painted by its prior owner with several coats of high gloss latex paint. 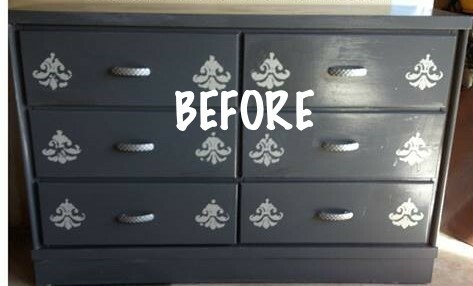 It also had thick, stenciled fleur-de-lis on each drawer. I like to sand stencils completely because their thickness can show through the final paint job. I used medium grit sandpaper to remove the gloss and stencils, then fine grit for final smoothness. I like to mark the bottom of each drawer with its “position” as I remove it. (“UR” for upper right, “ML” for middle left, etc.) 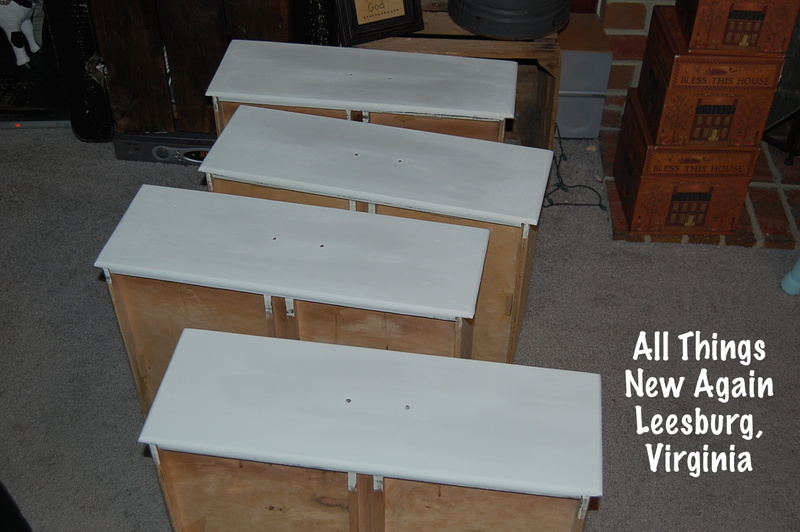 That way I won’t risk scratching or gouging the finished drawers by inserting them multiple times in my search for the correct opening. 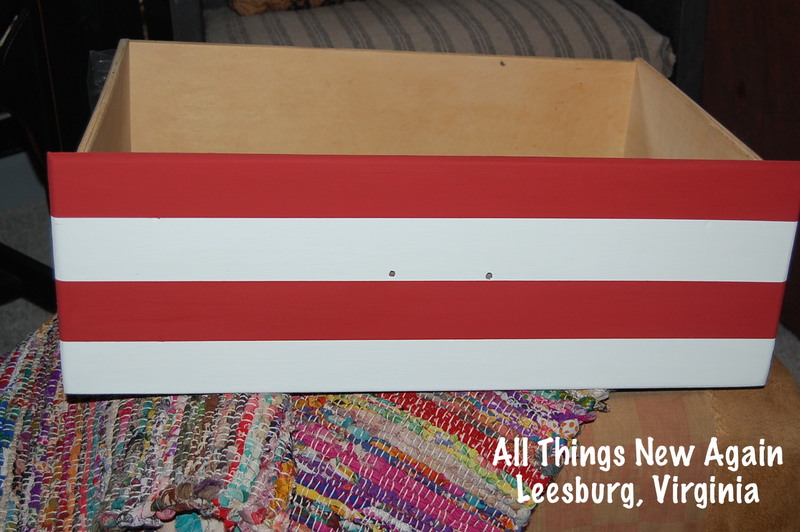 Next, I painted the cabinet and drawers of the Patriotic American Flag Dresser. The challenge for this project was painting an exact image of the American flag onto the dresser. The flag had to fit the space perfectly so I had to compute the width of the stripes and the size of the stars in correct proportion to the overall width (hoist) and length (fly) of the actual flag. Here’s the website I found with the standard proportions of an American flag to help me calculate this math problem. Dividing the height of the dresser by 13 to figure out the width of the stripes was the easy part. I also needed to figure out the size of the blue union and the diameter my stars needed to be in order for everything to fit in perfect proportion to the real deal. For this dresser, the stars needed to be 1 1/2″ diameter. Any larger and all 50 stars wouldn’t fit. Any smaller and it just wouldn’t look right. After computing the key flag dimensions from the dresser size, I marked the stripe and canton locations on the drawers. My handy drafting t-square kept my lines straight and parallel. A t-square is a great tool to have if you need straight lines longer than a standard 12 inch ruler. 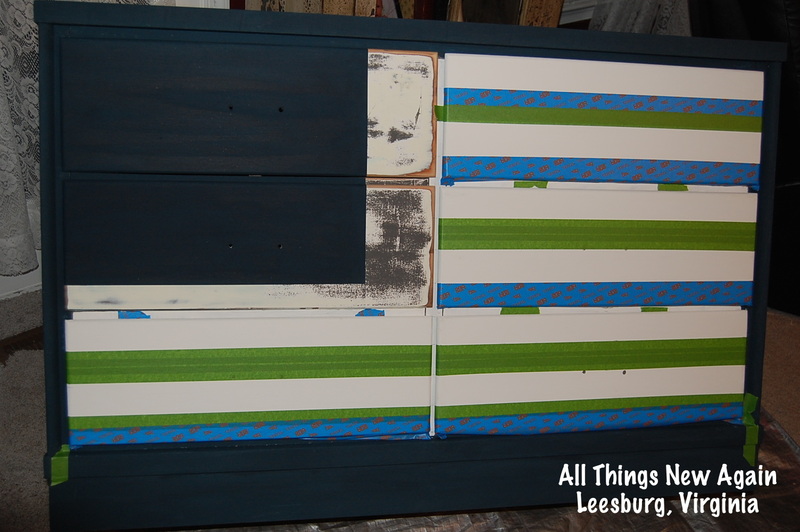 I used it for this Patriotic American Flag Dresser and any paint project where I need crisp lines or stripes. 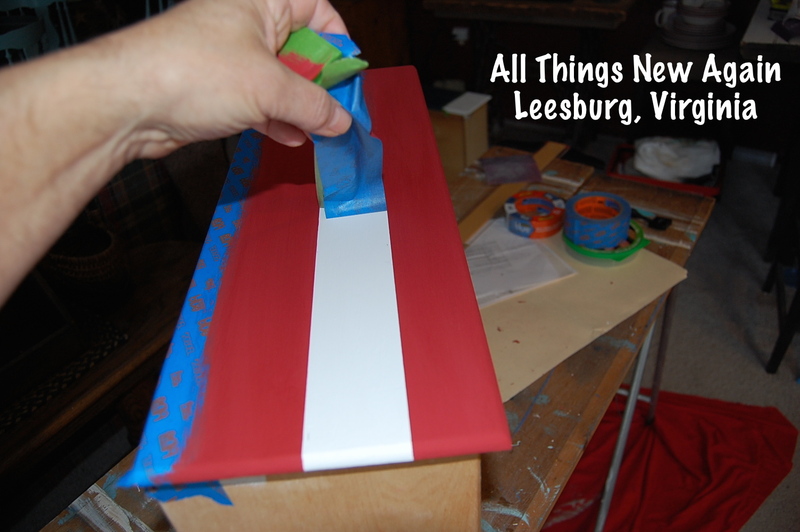 I then used painter’s tape to mark off the red stripes and the blue canton. 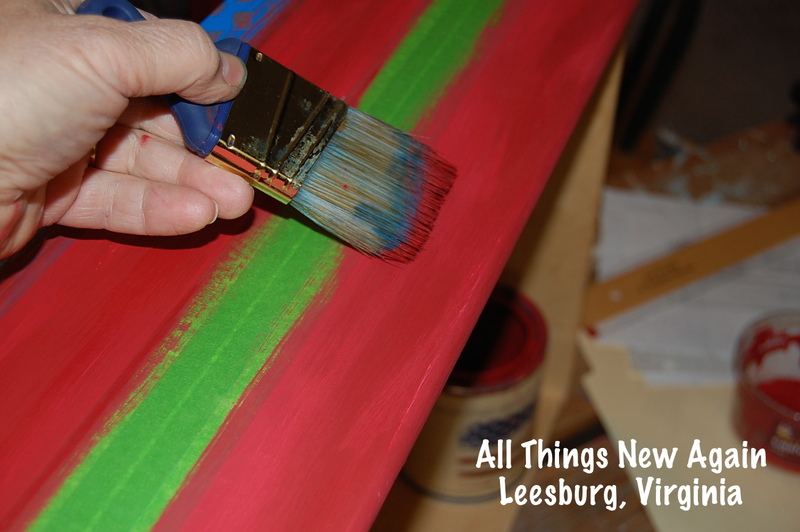 I applied 3 coats of each color, then let all dry thoroughly before carefully removing the tape to reveal crisp stripes. The next big challenge was applying the stars to the canton. I used an American Flag 50 Star Stencil like these to easily lay out all 50 stars in perfect proportion. For the size and proportions of this dresser, I chose a 17 x 13 inch stencil with 1 1/2″ diameter stars. Although this dresser has nice flat drawer surfaces, the edges have a slight curve that could have interfered with a smooth stencil job. 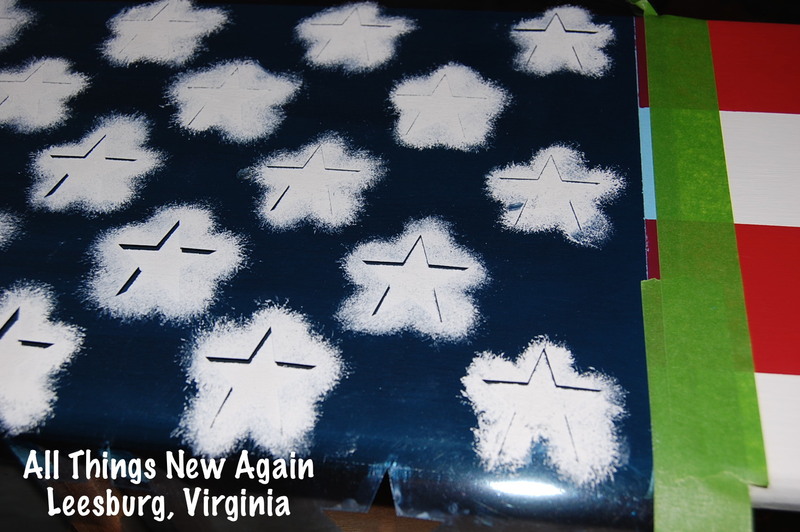 Three important tips worked well for me when I stenciled the stars. 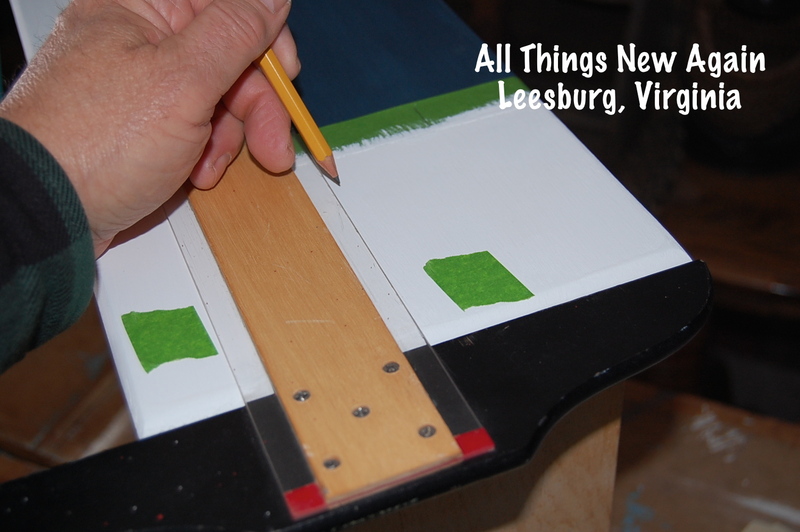 Tape the edges of the stencil firmly to ensure it does not move when applying the paint. Hold down the stencil around each star as you work on it. This was a very large stencil that needed some extra help staying flat, especially around the curved edges. Apply many light coats of paint on the star cutouts and let each coat dry thoroughly. 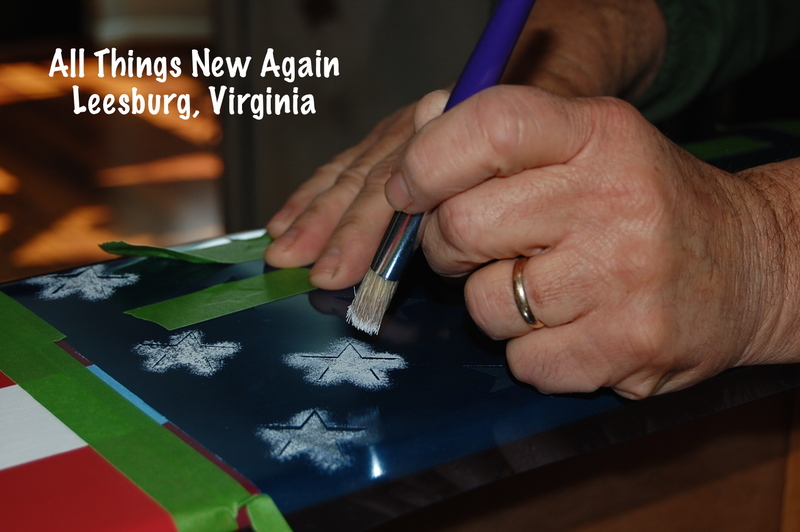 This last tip prevented the paint from bleeding beneath the plastic stencil and thereby smearing the stars. 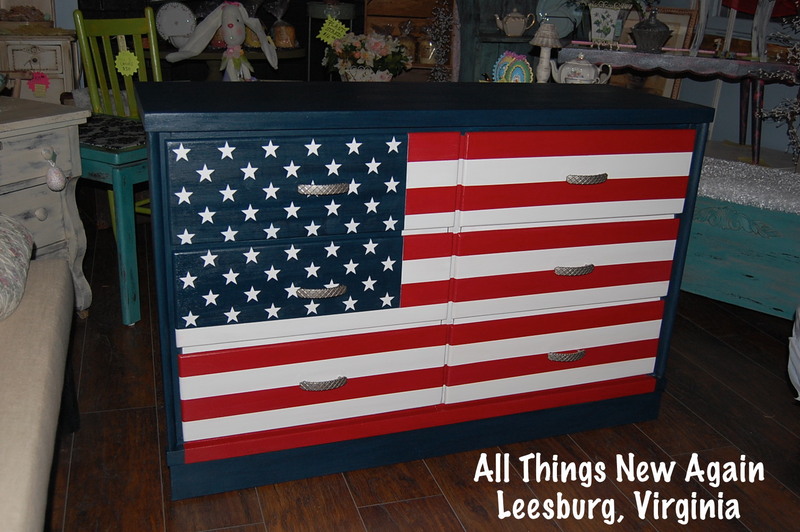 Here’s the finished Patriotic American Flag Dresser! 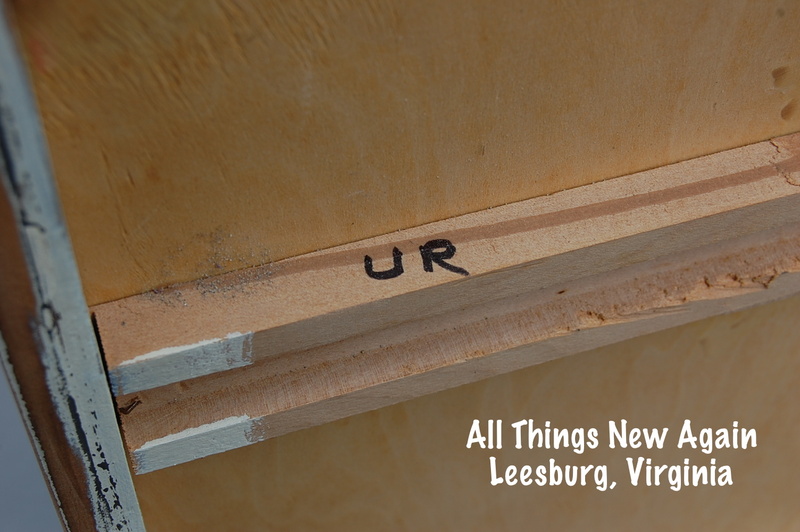 All Things New Again is a family-owned furniture and paint boutique in Leesburg, Virginia (about an hour or so west of Washington, D.C.) We offer our own eclectic brand of hand-painted furniture, several lines of paint for your next DIY project, and painting classes and workshops. 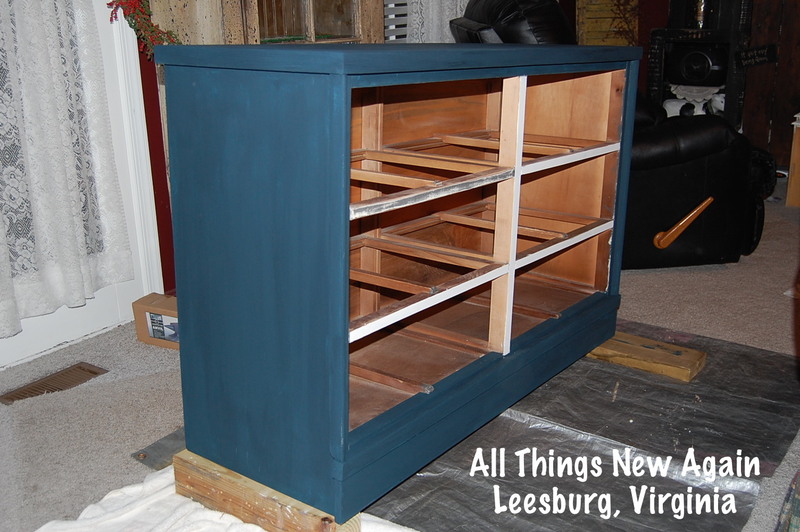 Follow our All Things New Again Facebook page and tune in Fridays at 12 noon (eastern time) for our LIVE Furniture Painting Friday Show! Wonderful tutorial its full of good information and easy instructions! Wow! That is awesome! Your attention to detail is amazing. Thank you for sharing at What We Accomplished Wednesdays. Have a great week!